Get ready for a new round of really gross Weiner puns: Anthony Weiner, the former congressman who resigned in disgrace for sending crotch-shots to ladies on the Internet and then lying about it, is now leading the Democratic primary race for the next mayor of New York. 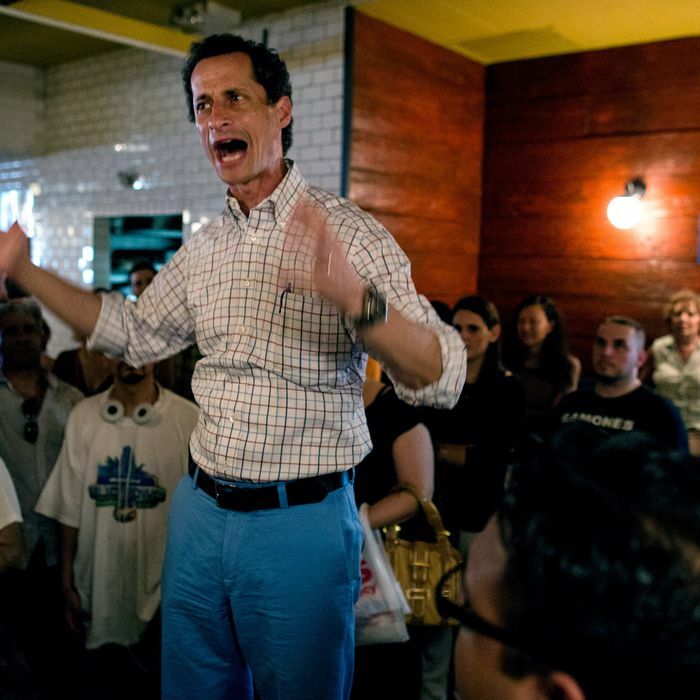 Your eyes do not deceive you, reader: Anthony Weiner is leading the race for mayor. An NBC/Wall Street Journal poll has Weiner at 25 percent to Christine Quinn’s 20 percent, and 49 percent of voters now say they are at least open to voting for Weiner, up from the 40 percent who said the same thing before he started campaigning. Weiner “carries his lead across racial, gender and geographic lines,” The Wall Street Journal reports — including, just barely, women. It is not clear how many of these women personally received crotch-shots from Anthony Weiner.